Thrombocytopenia refer to a disorder in which there is a relative decrease of thrombocytes, commonly known as platelets, present in the blood. A normal human platelet count ranges from 150,000 to 450,000 platelets per microliter of blood. These limits are determined by the 2.5th lower and upper percentile, so values outside this range do not necessarily indicate disease. One common definition of thrombocytopenia that requires emergency treatment is a platelet count below 50,000 per microliter. Thrombocytopenia usually has no symptoms and is picked up on a routine full blood count (or complete blood count). Some individuals with thrombocytopenia may experience external bleeding such as nosebleeds, and/or bleeding gums. Some women may have heavier or longer periods or breakthrough bleeding. Bruising, particularly purpura in the forearms, may be caused by spontaneous bleeding under the skin. Petechia (pinpoint bleeds in the skin and mucous membranes), may occur on feet and legs. Eliciting a full medical history is vital to ensure the low platelet count is not due to a secondary process. It is also important to ensure that the other blood cell types, such as red blood cells and white blood cells, are not also suppressed. Painless, round and pinpoint (1 to 3 mm in diameter) petechiae usually appear and fade, and sometimes group to form ecchymoses. Larger than petechiae, ecchymoses are purple, blue or yellow-green areas of skin that vary in size and shape. They can occur anywhere on the body. A person with this disease may also complain of malaise, fatigue and general weakness (with or without accompanying blood loss). In acquired thrombocytopenia, the patient's history may include the use of one or several offending drugs. Inspection typically reveals evidence of bleeding (petechiae or ecchymoses), along with slow, continuous bleeding from any injuries or wounds. Adults may have large, blood-filled bullae in the mouth. If the person's platelet count is between 30,000 and 50,000/mm3, bruising with minor trauma may be expected; if it is between 15,000 and 30,000/mm3, spontaneous bruising will be seen (mostly on the arms and legs). The causes of thrombocytopenia can be inherited or acquired. can be due to immune or non-immune reasons. Laboratory tests might include: full blood count, liver enzymes, kidney function, vitamin B12 levels, folic acid levels, erythrocyte sedimentation rate, and peripheral blood smear. If the cause for the low platelet count remains unclear, a bone marrow biopsy is usually recommended, to differentiate whether the low platelet count is due to decreased production or peripheral destruction. Thrombocytopenia in hospitalized alcoholics may be caused by spleen enlargement, folate deficiency, and, most frequently, a direct toxic effect of alcohol on production, survival time, and function of platelets. Platelet count begins to rise after 2 to 5 days' abstinence from alcohol. The condition is generally benign, and clinically significant hemorrhage is rare. In severe thrombocytopenia, a bone marrow study can determine the number, size and maturity of the megakaryocytes (the bone marrow cells that release mature platelets). This information may identify ineffective platelet production as the cause of thrombocytopenia and rule out a malignant disease process at the same time. Treatment is guided by the cause and disease severity. The main concept in treating thrombocytopenia is to eliminate the underlying problem, whether that means discontinuing suspected drugs that cause thrombocytopenia, or treating underlying sepsis. Diagnosis and treatment of serious thrombocytopenia is usually directed by a hematologist. Corticosteroids may be used to increase platelet production. Lithium carbonate or folate may also be used to stimulate the bone marrow production of platelets. Treatment of thrombotic thrombocytopenic purpura is a medical emergency, since the hemolytic anemia and platelet activation can lead to renal failure and changes in the level of consciousness. Treatment of TTP was revolutionized in the 1980s with the application of plasmapheresis. According to the Furlan-Tsai hypothesis  this treatment theoretically works by removing antibodies directed against the von Willebrand factor cleaving protease, ADAMTS-13. The plasmapheresis procedure also adds active ADAMTS-13 protease proteins to the patient, restoring a more physiological state of von Willebrand factor multimers. Patients with persistent antibodies against ADAMTS-13 do not always manifest TTP, and these antibodies alone are not sufficient to explain how plasmapheresis treats TTP. Many cases of ITP can be left untreated, and spontaneous remission (especially in children) is not uncommon. However, counts of under 50,000 are usually monitored with regular blood tests, and those with counts of under 10,000 are usually treated, as the risk of serious spontaneous bleeding is high with a platelet count this low. Any patient experiencing severe bleeding symptoms is also usually treated. The threshold for treating ITP has decreased since the 1990s, and hematologists recognize that patients rarely spontaneously bleed with platelet counts greater than 10,000—though there are documented exceptions to this observation. Thrombopoetin analogues have been tested extensively for the treatment of ITP. These agents had previously shown promise but had been found to stimulate antibodies against endogenous thrombopoietin or lead to thrombosis.Romiplostim (trade name Nplate, formerly AMG 531) was found to be safe and effective for the treatment of ITP in refractory patients, especially those who relapsed following splenectomy. Discontinuation of heparin is critical in a case of HITT. Beyond that, however, clinicians generally treat to avoid a thrombosis, and patients started directly on warfarin  For this reason, patients are usually treated with a type of blood thinner called a direct thrombin inhibitor such as lepirudin or argatroban, which are approved by the U.S. Food and Drug Administration (FDA). Other blood thinners sometimes used in this setting that are not FDA-approved for treatment of HITT include bivalirudin and fondaparinux. Platelet transfusions are not a routine component of the treatment of HITT, since thrombosis, not bleeding, is the usual associated problem in this illness. Bone marrow/stem cell transplant is the only thing that ultimately cures this genetic disease. Frequent platelet transfusions are required to keep the patient from bleeding to death until transplant is done, although this is not always the case. Thrombocytopenia affects a few percent of newborns, and its prevalence in neonatal intensive care units (NICU) is high. Normally, its course is mild and it resolves without consequences. Most of the cases of thrombocytopenia affect preterm birth infants and are results of placental insufficiency and/or fetal hypoxia. The other causes are less frequent, e.g. alloimmune, genetic, autoimmune, infection, and DIC. Thrombocytopenia that starts after the first 72 hours since birth is often the result of underlying sepsis or necrotizing enterocolitis (NEC). In the case of infection the PCR tests may be useful for rapid pathogen identification and detection of antibiotic resistance genes. The possible pathogens may be fungus, bacteria and viruses, for example: Cytomegalovirus (CMV), rubella virus, HIV, Staphylococcus sp., Enterococcus sp., Streptococcus agalactiae (GBS), Listeria monocytogenes, Escherichia coli, Haemophilus influenzae, Klebsiella pneumoniae, Pseudomonas aeruginosa, Yersinia enterocolitica, Candida sp., and Toxoplasma gondii. The severity of thrombocytopenia might be correlated with the type of a pathogen; some research indicates that the most severe cases are related to fungal or gram-negative bacterial infection. The pathogen may be transmitted during birth or prior to it, but also by breast feeding or during transfusion. Interleukin-11 is being investigated as a potential drug for aiding thrombocytopenia management, especially in the cases of sepsis or necrotizing enterocolitis (NEC). ↑ Deutschman, Clifford S.; Neligan, Patrick J. (2010). Evidence-based Practice of Critical Care. Elsevier Health Sciences. ISBN 1416054766. Retrieved 2015-04-30. ↑ "Platelet count: MedlinePlus Medical Encyclopedia". www.nlm.nih.gov. Retrieved 2015-05-01. ↑ "What Is Thrombocytopenia? - NHLBI, NIH". www.nhlbi.nih.gov. Retrieved 2015-05-01. 1 2 3 BHATIA, M.P.S. "B.E. PROJECT ON PLATELET COUNT USING IMAGE PROCESSING TECHNIQUES" (PDF). BTP_Report. Retrieved 30 November 2014. ↑ Houghton, Andrew R.; Gray, David (2010-05-28). Chamberlain's Symptoms and Signs in Clinical Medicine 13th Edition, An Introduction to Medical Diagnosis. CRC Press. ISBN 9780340974254. Retrieved 2015-05-01. ↑ Interpreting Signs and Symptoms. Lippincott Williams & Wilkins. 2007. p. 293. ↑ Rosdahl, Caroline Bunker; Kowalski, Mary T. (2008). Textbook of Basic Nursing. Lippincott Williams & Wilkins. ISBN 9780781765213. Retrieved 2015-05-01. ↑ "What Causes Thrombocytopenia?". National Heart, Lung, and Blood Institute. Retrieved 4 December 2014. ↑ Fiebach, Nicholas H.; Barker, Lee Randol; Burton, John Russell; Zieve, Philip D. (2007). Principles of Ambulatory Medicine. Lippincott Williams & Wilkins. ISBN 9780781762274. Retrieved 2015-04-30. ↑ Rodak, Bernadette F.; Fritsma, George A.; Keohane, Elaine (2013-12-27). Hematology: Clinical Principles and Applications. Elsevier Health Sciences. ISBN 9780323292696. Retrieved 2015-04-30. ↑ Sharp, Tyler; Muñoz-Jordán, Jorge; Perez-Padilla, Janice; Bello-Pagán, Melissa; Rivera, Aidsa; Pastula, Daniel; Salinas, Jorge; Martinez Mendez, Jose; Mendez, Monica; Powers, Ann; Waterman, Stephen; Rivera-García, Brenda (14 July 2016). "Zika Virus Infection Associated with Severe Thrombocytopenia" (PDF). Clin Infect Dis. Clinical Infectious Diseases. 63 (3). doi:10.1093/cid/ciw476. Retrieved 19 July 2016. ↑ Gresele, Paolo; Fuster, Valentin; Lopez, Jose A.; Page, Clive P.; Vermylen, Jos (2007-12-13). Platelets in Hematologic and Cardiovascular Disorders: A Clinical Handbook. Cambridge University Press. ISBN 9781139468763. Retrieved 2015-04-30. ↑ Waldmann, Carl; Soni, Neil; Rhodes, Andrew (2008-11-27). Oxford Desk Reference: Critical Care. Oxford University Press. ISBN 9780199229581. Retrieved 2015-05-01. ↑ Dart, Richard C. (2004). Medical Toxicology. Lippincott Williams & Wilkins. ISBN 9780781728454. Retrieved 2015-05-01. ↑ Greer, John P.; Arber, Daniel A.; Glader, Bertil; List, Alan F.; Means, Robert T.; Paraskevas, Frixos; Rodgers, George M. (2013-08-29). Wintrobe's Clinical Hematology. Lippincott Williams & Wilkins. ISBN 9781469846224. Retrieved 2015-05-01. 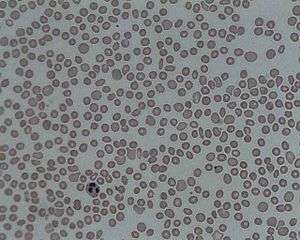 ↑ "How Is Thrombocytopenia Diagnosed? - NHLBI, NIH". www.nhlbi.nih.gov. Retrieved 2015-05-19. ↑ Lieber, Charles S. (2012-12-06). Medical and Nutritional Complications of Alcoholism: Mechanisms and Management. Springer Science & Business Media. ISBN 9781461533207. ↑ Hillyer, Christopher D.; Abrams, Charles S.; Shaz, Beth H.; Roshal, Mikhail; Zimring, James C.; Abshire, Thomas C. (2009-06-09). Transfusion Medicine and Hemostasis: Clinical and Laboratory Aspects. Elsevier. ISBN 9780080922300. Retrieved 2015-05-01. ↑ Lawrence, Peter F.; Bell, Richard M.; Dayton, Merril T. (2012-10-31). Essentials of General Surgery. Lippincott Williams & Wilkins. ISBN 9780781784955. ↑ "Thieme E-Journals - Seminars in Thrombosis and Hemostasis / Full Text". www.thieme-connect.com. Retrieved 2015-05-01. ↑ "How Is Thrombotic Thrombocytopenic Purpura Treated? - NHLBI, NIH". www.nhlbi.nih.gov. Retrieved 2015-05-20. ↑ Thrombocytopenic Purpura: New Insights for the Healthcare Professional: 2013 Edition: ScholarlyPaper. ScholarlyEditions. 2013-07-22. ISBN 9781481662420. ↑ "Idiopathic thrombocytopenic purpura (ITP): MedlinePlus Medical Encyclopedia". www.nlm.nih.gov. Retrieved 2015-05-20. ↑ "Nplate (romiplostim) for subcutaneous injection". www.fda.gov. Retrieved 2015-05-02. ↑ Warkentin, Theodore E.; Greinacher, Andreas (2007-07-23). Heparin-Induced Thrombocytopenia. CRC Press. ISBN 9781439826423. ↑ Ahmed, I; Majeed, A; Powell, R (2007). "Heparin induced thrombocytopenia: diagnosis and management update". Postgraduate Medical Journal. 83 (983): 575–582. doi:10.1136/pgmj.2007.059188. ISSN 0032-5473. PMC 2600013 . PMID 17823223. ↑ Smit-Sibinga, C. Th (2010-05-10). Neonatology and Blood Transfusion. Springer Science & Business Media. ISBN 9780387236001. 1 2 3 4 5 6 7 8 9 10 Roberts, I; Murray, NA (2003). "Neonatal thrombocytopenia: causes and management". Archives of Disease in Childhood: Fetal and Neonatal Edition. 88 (5): F359–64. doi:10.1136/fn.88.5.F359. PMC 1721612 . PMID 12937037. 1 2 3 4 5 6 7 Guida, JD; Kunig, AM; Leef, KH; McKenzie, SE; Paul, DA (2003). "Platelet count and sepsis in very low birth weight neonates: is there an organism-specific response?". Pediatrics. 111 (6 Pt 1): 1411–5. doi:10.1542/peds.111.6.1411. PMID 12777561. ↑ D Dzierzanowska (2001). Antybiotykoterapia praktyczna. ISBN 83-88778-20-X. 1 2 Pacifico, L; Chiesa, C; Mirabella, S; Panero, A; Midulla, M (1987). "Early-onset Pseudomonas aeruginosa sepsis and Yersinia enterocolitica neonatal infection: a unique combination in a preterm infant". European journal of pediatrics. 146 (2): 192–3. doi:10.1007/BF02343233. PMID 3569360. ↑ Rempen, A; Martius, J; Hartmann, AA; Wecker, I (1987). "Transmission rate of Ureaplasma urealyticum, Mycoplasma spp., Gardnerella vaginalis, B-streptococci, Candida spp. and Chlamydia trachomatis from the mother to the newborn". Archives of gynecology and obstetrics. 241 (3): 165–70. doi:10.1007/BF00931313. PMID 3324978. ↑ Olver, WJ; Bond, DW; Boswell, TC; Watkin, SL (2000). "Neonatal group B streptococcal disease associated with infected breast milk". Archives of Disease in Childhood: Fetal and Neonatal Edition. 83 (1): F48–9. doi:10.1136/fn.83.1.F48. PMC 1721104 . PMID 10873172. ↑ Kotiw, M; Zhang, GW; Daggard, G; Reiss-Levy, E; Tapsall, JW; Numa, A (2003). "Late-onset and recurrent neonatal Group B streptococcal disease associated with breast-milk transmission". Pediatric and developmental pathology : the official journal of the Society for Pediatric Pathology and the Paediatric Pathology Society. 6 (3): 251–6. doi:10.1007/s10024-001-0276-y. PMID 12687430. ↑ Gastelum, DT; Dassey, D; Mascola, L; Yasuda, LM (2005). "Transmission of community-associated methicillin-resistant Staphylococcus aureus from breast milk in the neonatal intensive care unit". The Pediatric Infectious Disease Journal. 24 (12): 1122–4. doi:10.1097/01.inf.0000189983.71585.30. PMID 16371885. ↑ Jagielski, Marek; Rastawicki, Waldemar; Kałużewski, Stanisław; Gierczyński, Rafał (2007). "Jersinioza – niedoceniana choroba zakaźna" [Yersiniosis – unappreciated infectious diseases] (PDF). Przegl Epidemiol (in Polish). 56 (1): 57–64. PMID 12150068.